Andy Burnham. Sophia & M.E. Her Story. Transparent Appraisals ?. Voices from the Shadows. My name is Criona Wilson. I am the mother of Sophia Mirza. She was the youngest of my four children. Sophia suffered from severe (M.E./CFS) since 1999. She died on 25th November 2005. She was only 32. 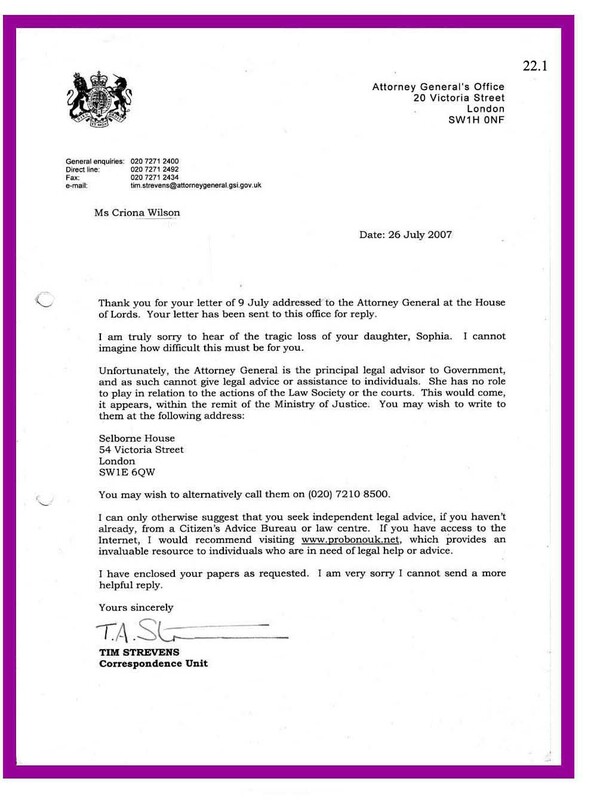 An inquest was held in June 2006 which recorded the cause of her death asChronic Fatigue Syndrome ( letter 1 ). Her story is in the enclosed booklet which I wrote for her friends after her death. It can also be 'googled' on 'Invest in M.E.' or `25%M.E`. as well as 'Sophia Mirza M.E. about the 6 doctors involved in her treatment ( letter 3 ) I also made complaints about the social worker involved ( letter 4 ),( letter 5 ) and( letter 6 ). These are ongoing. 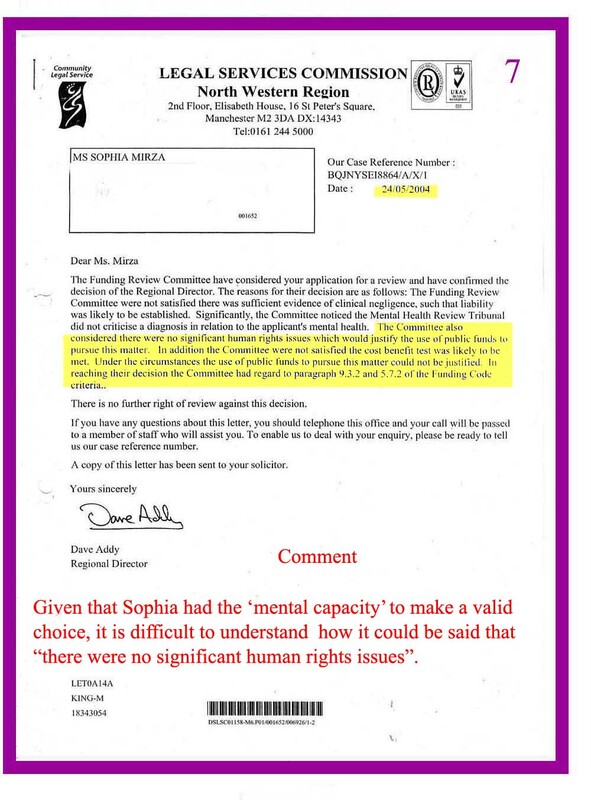 After the Tribunal discharged Sophia from the mental hospital in 2003, she sought legal aid to pursue her claim against what the professionals had done to her. been told that I would have to go through the courts to get access to the rest of them. However, I believe that the GMC have them now. 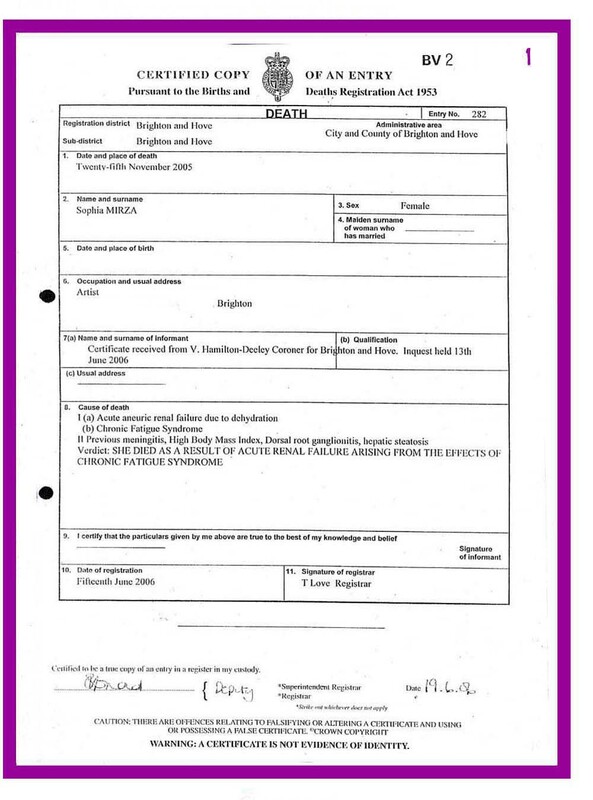 During and after Sophia's illness and death I've had great difficulty in understanding what the medical and legal professionals have claimed as 'fact' and 'legal' and should therefore be accepted as such by Sophia and me. 1. It has been logged that Sophia had severe M.E. ( letter 8 ), which according to the World Health Organisation (WHO) since 1969, has held this to be a physical neurological disease and not a mental illness. 3. It is also documented that Sophia's G.P. asked to have me sectioned ( letter 13 ). A few years earlier the same doctor said that she didn't want me looking after Sophia; she wanted Sophia to be placed in an institution. 4 - Sophia was removed from 2 G.P's list without her request. They did not even come out to see her when she died as they had removed her from their list 4 months previously. 5. The social worker saw Sophia only once in September 2002. She wrote a report ( letter 14 ) Nine months later she acquired a Section 135 from the magistrate's court in which she lied under oath, thereby committing perjury ( letter 15 ), in order to force Sophia to be remanded in a mental hospital. 6. 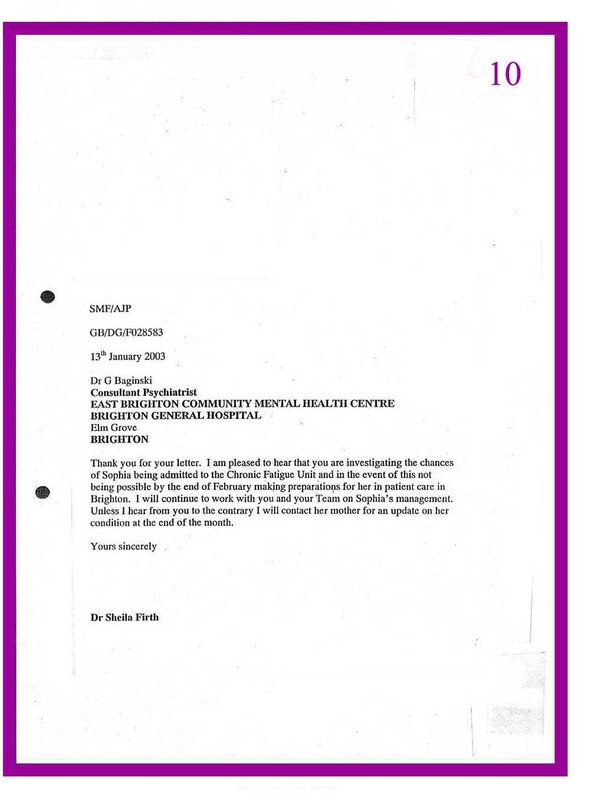 1 wrote two letters to the Chief Executive of the Health Trust, informing him of the events that were about to unfold, as threatened by the psychiatrist ( letter 16 ) AND ( letter 17 ). He never answered. 7. I wrote twice to the manager of the magistrate's Courts informing them of what was about to happen ( letter 18 ). There was no reply. • A disease, deemed physical by the WHO can be treated as though the patients are mentally ill, with no consideration of the available evidence. •	A social worker who had only seen Sophia the once, could, nine months later, go to the magistrate's court and commit perjury in order to ensure that Sophia would be incarcerated in the mental hospital. 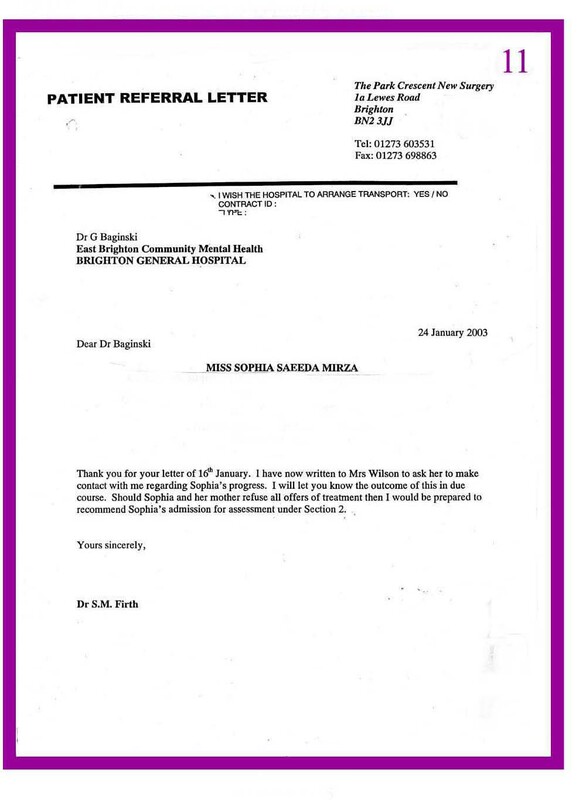 •	Doctors could write to one another stating that if Sophia would not agree to go into the M.E. Clinic at Romford, then they would section her. •	The Chief Executive of the Health Trust could ignore information given to him, and chose not to respond. •	The s 135 was issued, despite the fact that I had alerted the Court Manager by letter on two occasions. •	Two sets of doctor's practices could unilaterally remove such a sick person from their lists, thereby abdicating all responsibility. •	A doctor, who is not in my practice, would ask to have me sectioned. •	When Sophia was alive, that she was refused legal aid, despite the fact that perjury was the basis on which she was 'sectioned'. Now that Sophia is dead I have been told that I cannot get legal aid to start an action against any of the parties involved so as to gain answers to the above. The reason given was the fact that she had no dependants and was single. None of what was done to Sophia by the doctors, social worker, Chief Executive, Court Manager and Hospital workers has ever made any sense to me. I found it brutalising in the extreme; more so as I am a trained nurse and midwife. I also believe that it was illegal. It appears that no one wants to know or care what was done to her and what is still being done to many families across the land who have the misfortune to have M.E. I have a very bad memory and because of this have to keep documents of everything. I'm enclosing a few of the letters along with the index to give you an idea of the extent and range of the information available, should you require it. Up until now, every door has been slammed in my face. It seems to me that no one, either medically or legally, has been able to explain to me in any terms, how the parties involved in my daughter's treatment and death could threaten Sophia and then implement these threats with such deadly results. It appears to be of no consequence to them that my young vibrant and courageous daughter, Sophia, died as a result of their decisions; these decisions did not have a legal, medical or procedural basis and appear to me, to be their own unilateral illegal, decisions. I'm writing to you as I've tried to get answers and representation from everyone, without success. As the Attorney General I do believe your involvement is now required. I will not stop posing these questions until there is accountability and transparency regarding my child's suffering and death. Note:- the INDEX referred to in the third last paragragh above links to the DOCUMENTS INDEX . 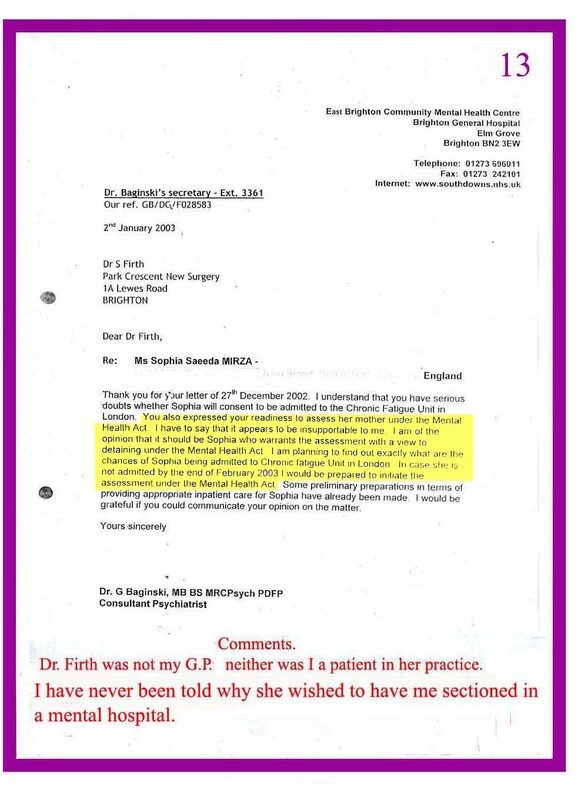 10 13 01 2003 Dr. Firth to Dr. Baginski re:- admission to CFS Unit and if not,"in patient care in Brighton"
12 12 02 2003 Dr. Baginski to Dr. Firth confirming admission under section 2, should Sophia refuse to go into the Chronic Fatigue Unit in Romford. 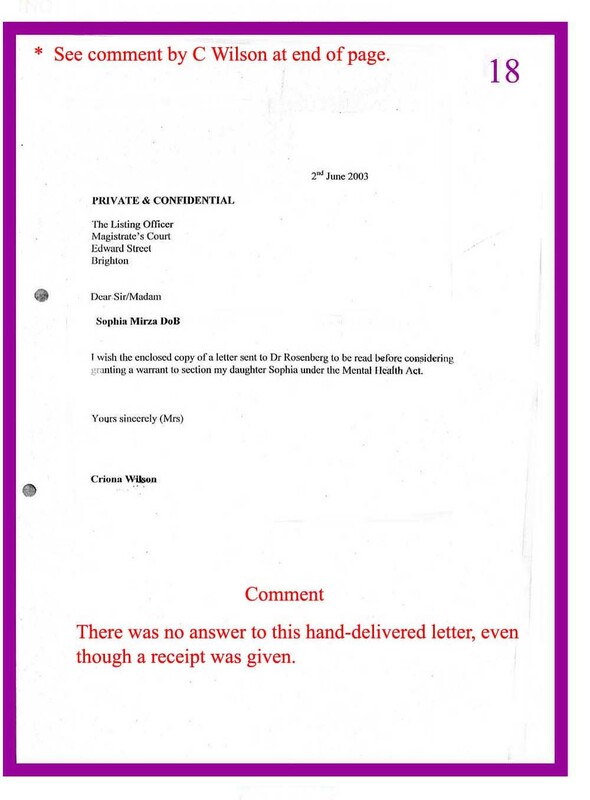 13 02 01 2003 Dr.Baginski to Dr. Firth - "....you also expressed yourreadiness to assess her mother under the Mental Health Act....."
15 23 06 2003 Catherine Connolly gets the warrant to enable Sophia to be sectioned under the Mental Health Act. 20 20 06 2007 Dept. of Health to Criona Wilson. 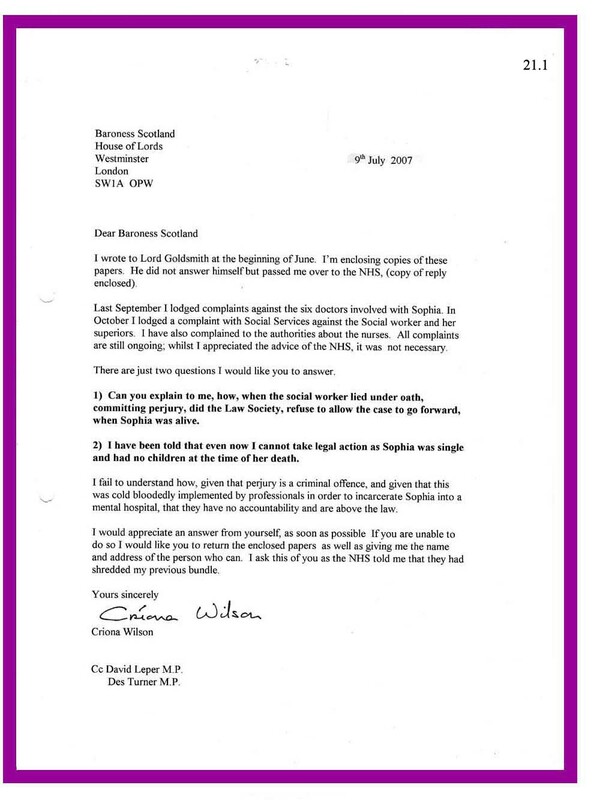 21 09 07 2007 Criona Wilson to Baroness Scotland. 22 26 07 2007 Attorney Generals Office to Criona Wilson. 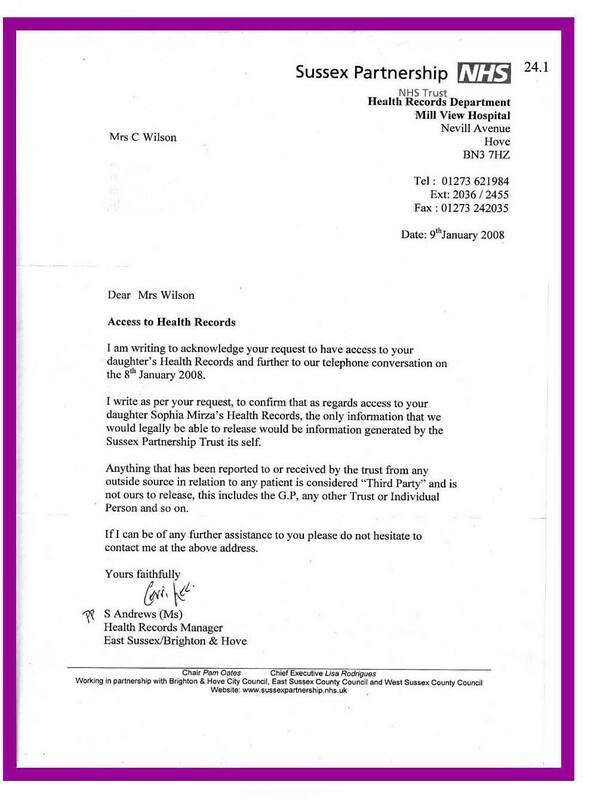 23 17 12 2007 Health records to Criona Wilson. 24 09 01 2008 Health records to Criona Wilson.